I’ve received several emails and Facebook messages asking me why I haven’t written about Trump’s recently unveiled budget proposal for the 2019 fiscal year. My answer is that I don’t want to waste my time. Let me explain what I mean. I wrote during the 2016 campaign that Trump was a big-government Republican. But when he got elected and appointed some good people to fiscal positions, I decided to partially suppress my concerns. After all, maybe I was wrong. So I wrote last year about his budget and praised specific provisions (dealing with government-funded media, food stamps, government-funded art, foreign aid, OECD subsidies, community development block grants, and Medicaid). And I even outlined the strategy that was necessary to achieve success, at least with regards to so-called discretionary spending. But I included a very important postscript as part of that column. Well, that battle occurred and the result was a disaster for taxpayers. The budget caps were busted again, with the net effect being even worse than the big-spending agreements back in 2013 and 2015. But it’s not that the Trump Administration lost. They never even tried. The folks I know on Capitol Hill said the White House didn’t lift a finger to urge spending restraint, much less fight to limit budgetary growth. Never. And the painful experience of the profligate Bush years taught me that most Republican Senators and Representatives will partake in a spending spree when they sense the White House is soft on the issue (the common excuse I get from them is that “the floodgates have opened, I can’t do anything to stop it, so I may as well get a chunk for my voters”). What’s extra depressing is that Trump’s fiscal incontinence is actually par for the course for Republican presidents, at least in recent decades. 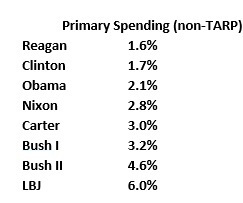 I recently crunched the numbers for every president since the 1960s who served at least one full term, and I measured the average annual growth of government spending (adjusted for inflation) for the years they held power. Moreover, I sliced and diced the numbers in several ways. I wanted readers to understand what happened to total spending (the combined growth of defense and domestic outlays), as well as what happened to domestic spending. And the bottom line is that Republicans generally do worse than Democrats. Not just on total spending. 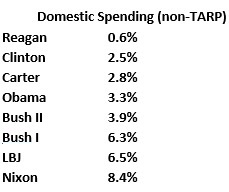 They’re even more profligate on domestic spending! The only exceptions to this pattern are Reagan (the only good Republican) and LBJ (the only really awful Democrat). By the way, I’m not claiming that Clinton, Carter, or Obama were fiscal conservatives or that they believed in small government. I’m simply pointing out government grew slower when they were in office, at least compared to the growth of government under Nixon, Bush I, or Bush 2. The numbers don’t lie. I suspect these counter-intuitive results are because of two factors. Presidents try to deflect and/or preempt criticism, so that leads Democrats to be cautious about spending money (they don’t want to be called “big spenders”) and it leads Republicans to squander a lot of cash (they don’t want to be called “heartless” or “mean”). The party controlling the White House often loses seats in mid-term elections and that subsequently limits the ability of presidents to push an agenda that is opposed by the other party, or even leads them to acquiesce to initiatives pushed by the other party. Needless to say, this is rather depressing for those of us who want to limit the size and scope of government. 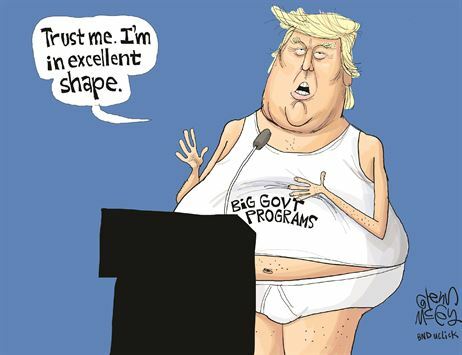 It’s quite likely that Trump will spend the next three years or seven years instigating and/or accepting bigger government. And then we’ll probably have a Democrat in the White House who will – at least for the first two years – push for even more government. But I get more upset when Republicans are big spenders because they should know better. Most Democrats actually believe it’s a good idea to make America more like Greece. Republicans, by contrast, make us more like Greece because they put short-term politics ahead of the national interest. 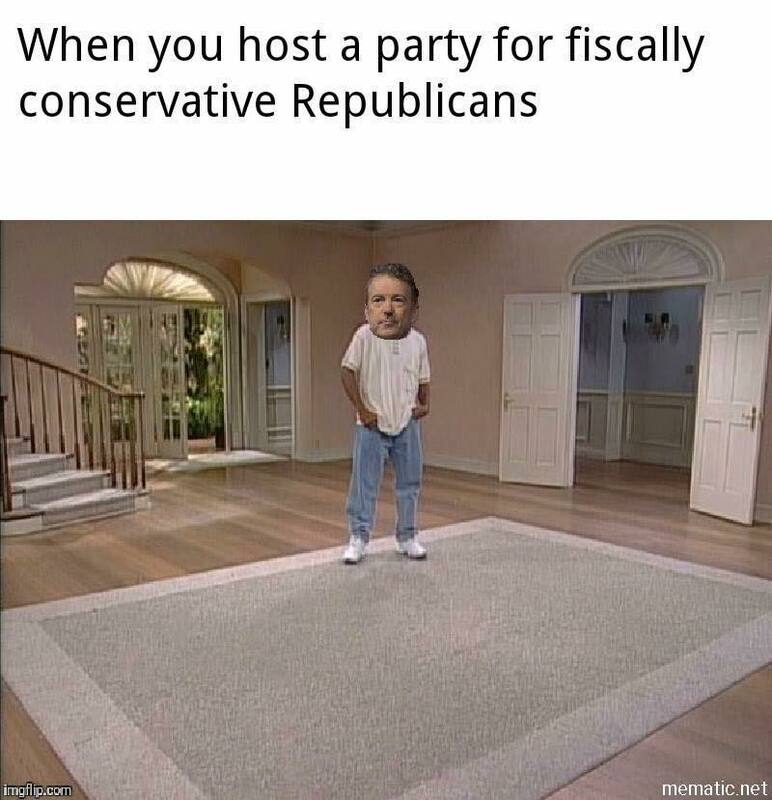 Let’s close this depressing column with some anti-GOP humor, starting with a look at how libertarians see Republicans (h/t: Reddit‘s libertarian page). Next we have a gathering of Republicans who actually believe in smaller government (h/t: Reddit‘s libertarian page). Last but not least, here’s some very clever satire from Babylon Bee. During a budgetary discussion Friday, Republican lawmakers announced a plan to pretend to be fiscally conservative again if a Democrat takes office again in 2020 or 2024. The GOP said it would begin to decry deficit spending and the $20 trillion debt in order to win votes as soon as political power swung back to the opposing party. “The second a Democrat is back in the White House, we will once again start yelling about fiscal responsibility,” Speaker Paul Ryan said in an address to the House of Representatives Friday. “For now, we will continue to vote for unsustainable and irresponsible budgets that your children’s children’s children will pay for for centuries to come.” At publishing time, Republicans further announced they would pretend to oppose giving Planned Parenthood a half billion dollars year after year once they need conservative voters’ support to regain their offices. Good dig about Planned Parenthood, needless to say. But as we laugh about these jokes, just remember that the recklessness in Washington is going to come back to bite us at some point. No, we won’t have a Greek-style fiscal crisis in the next five years. Or even in the next 10 or 20 years. But more spending and more dependency is not a good recipe for long-run economic health. Republicans understand that and I despise them for putting politics first and country second. When the GOP’s Saint of Fiscal Responsibility Paul Ryan was Chairman of the House Budget Committee, he asked the CBO to project the impact of higher (e.g., normal) interest rates on the size of the annual interest payments on the national debt. The CBO responded: disaster lies ahead if DC does not get its fiscal act together. So Saint Paul is going full speed ahead on accelerating our disaster. His top priorities are crystal clear: retaining his speakership, his Versailles-like speaker’s office suite and his speaker’s 24-7 limo. Dan(iel): me thinks your word “despise” does not do justice to Ryan’s perfidy. The joke is that it was no joke.